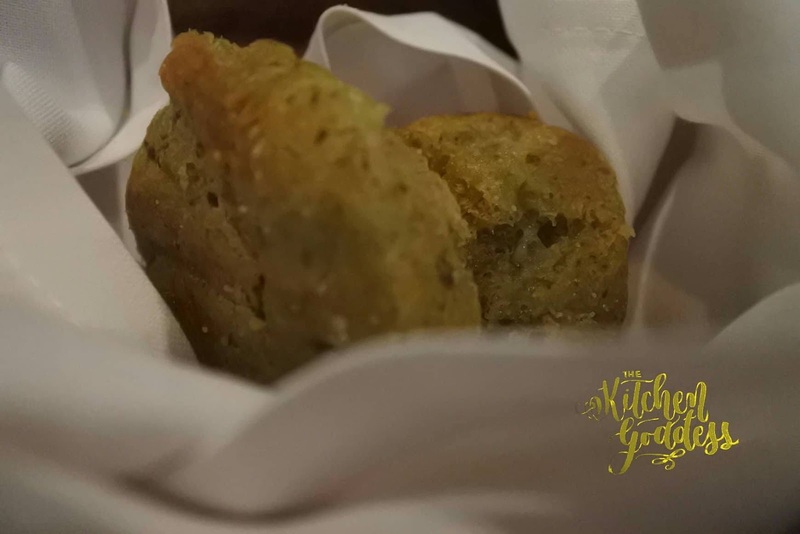 The Degustation begins with Kangkong Pesto Brioche served with Boursin Cheese, and Kesong Puti Croquettes at Lato with baby mesclun and salsa verde aioli. The Kangkong Pesto Brioche is a delightful and buttery discovery enhanced by the creamy Boursin Cheese. Next is Kesong Puti Croquettes at Lato with baby mesclun and salsa verde aioli. 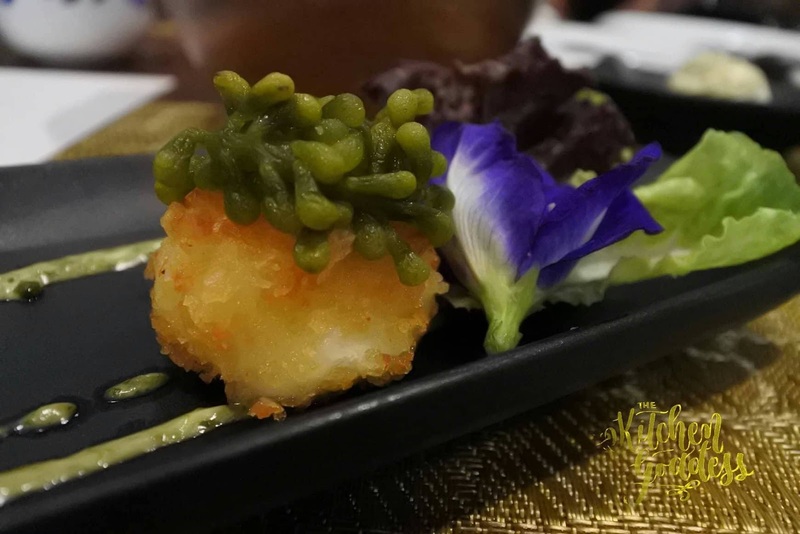 Here, the lato gives an interesting twist to the otherwise dry and chewy texture of kesong puti croquette. A lovely surprise is the edible flower that pairs well with the mesclun. The third part of the degustation is a charming Oyster Laing Rockefeller. 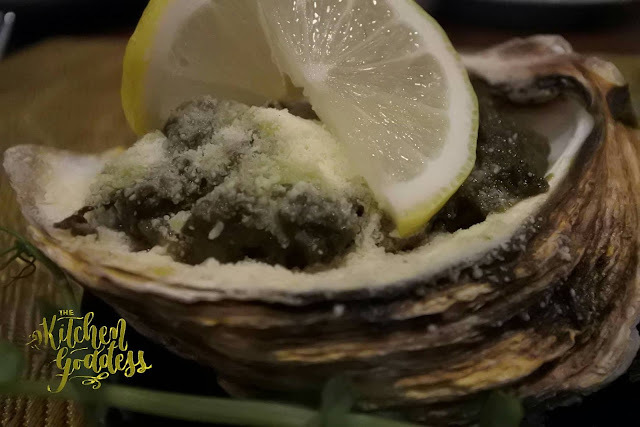 The contrasting flavor of the sea and earthy laing are intensified by Parmigiano Reggiano and lemon juice. Completing the first half of the degustation is Sayote Egg Drop Soup, a rich warm nourishing soup that will make you wonder- where's the sayote? 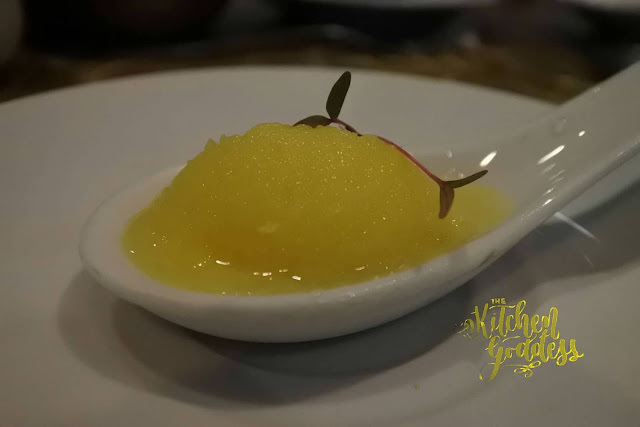 Before moving on to the mains, a Burong Mangga Sorbet is served to cleanse the palate. The tart flavor of the mango wakes up the senses and at the same time making sure that one is ready and excited for the next course. On to the mains with BBQ Pulled Pork Tostadas, a tribute to our diverse culinary heritage. 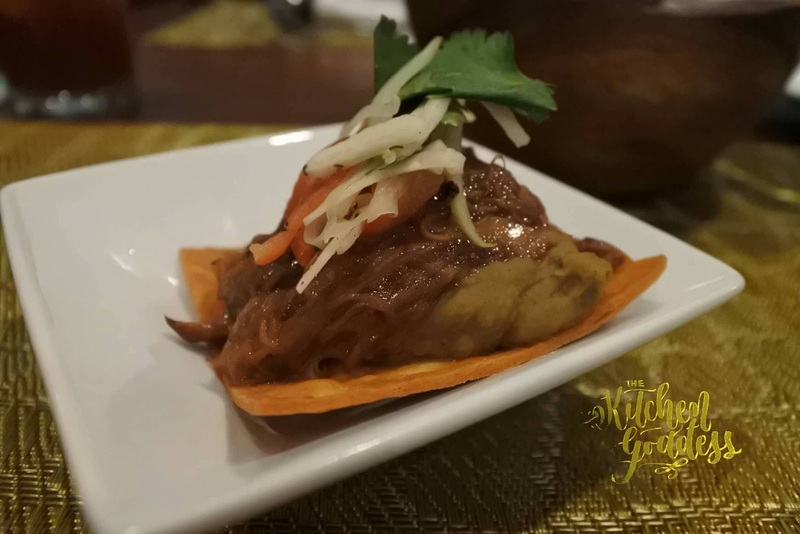 Slow-cooked pork marinated in Filipino-style BBQ sauce, and paired with mashed monggo (mung bean) and spices, and papaya slaw on top of fried tortilla becomes one of the highlight of the degustation. Another highlight is the Sea Bass Sinantol. The sinantol is the perfect accompaniment to the chunky portion of pan-seared Chilean sea bass fillet paired with rich and creamy sinantol (a dish made with cotton fruit and coconut milk) fried rice. 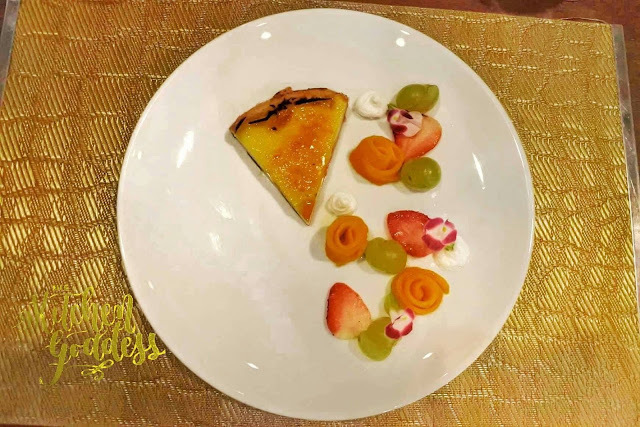 Capping the 8-course degustation is a sweet and dainty serving of Egg Pie Brulee with Rose creme Chantilly, Strawberry, Green grapes, Mango, and Edible flowers. 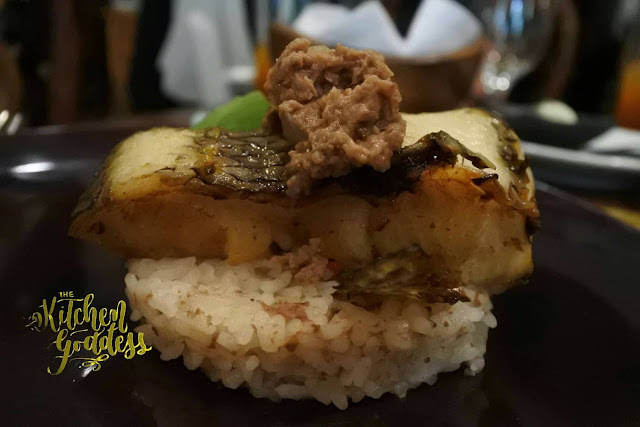 For the whole month of October, diners can savor the 8-course degustation for only P1,250+ or choose select dishes which is priced separately. 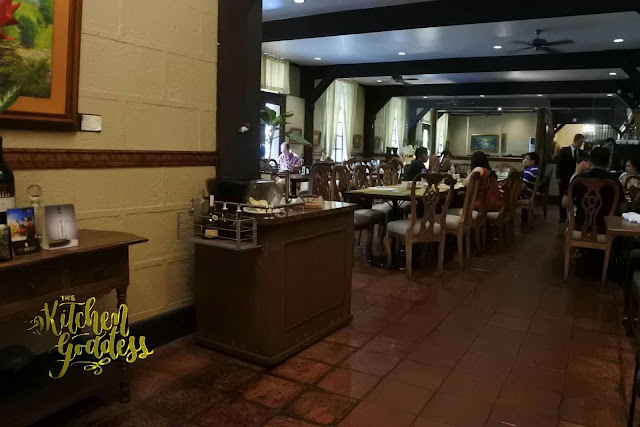 Call (02) 527-3474 / (02) 527-2345; email: caterings@ilustradorestaurant.com.ph for more details.